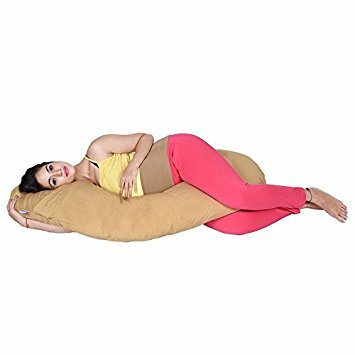 Pregnancy body pillows are large pillows that are available in many sizes and shapes, such as the U-shaped, the wedge, the bean-shaped, and many more. Although each type of them has different benefits, it is said that the pregnancy body pillows are the most comfortable for the majority of expecting mothers. helping them to sleep well. A pregnancy body pillow will provide support for your baby bump, back, neck, shoulder and legs, in other words, the whole body. It is designed specifically to help mothers-to-be sleep in a half fetal position, which is the best sleeping position especially for those suffering from back and neck pains. It also helps calm down those who worry too much about tossing and turning in their sleep, fearing they might accidentally pose too much pressure on their baby bump. This body pillow will limit your movements while sleeping, and thus helping you get uninterrupted sleep. Another benefit for the pregnancy body pillow, is that you can still use it after you've had your baby. You can use it while sleeping, as a support for the baby while nursing, or even as a barrier for your kid through his early years while sleeping to prevent him from rolling over. Body pillows can help relieve back pains for non-pregnant ladies and even men as well. It is even recommended for those who need to sleep with their feet slightly elevated than the rest of their body. Go for a pregnancy body pillow and always have peaceful uninterrupted sleep. This is the perfect product for the pregnant women to give them a sound sleep. I have not seen theae pillows in any market i think it could be bought online only. This is a very useful & interesting blog. Before reading this I didn't even know that products like these even existed. Thanks a lot for this informative post. I'm definitely gonna circulate this among my circle of friends.